Cards and Cooking Corner: Grow with all your heart! Hey peeps, I am back after many days. Both crafting and blogging has become very sporadic nowadays. As of yesterday all the exams are finished and we get the report cards on the 30th to officially finish this academic year. Kids have already got their schedules for the next year, so report cards are just to show how they did on their final exams. As suspected both my kids ended up in the same Math class😅, and they were not happy about it, so I had to write to the counselor to move one of them to a different class, and thankfully they did and its all good now! 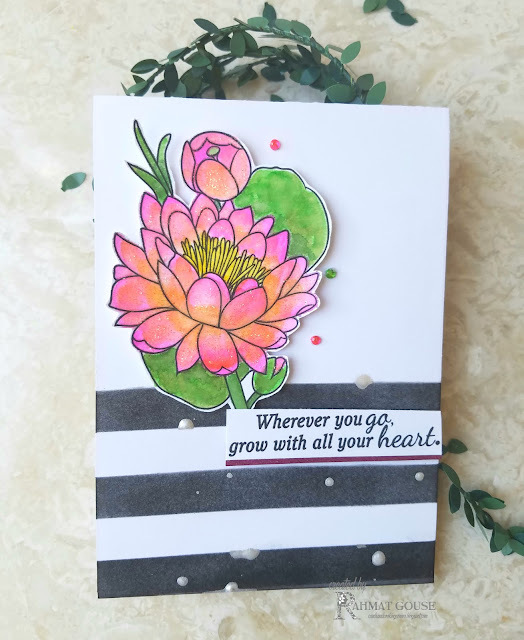 Ok to the card now, I used the freebie from Inspired by Stamping, it is in the latest Newsletter. I used Staedtler's Marsgraphic duo 3000 brush markers to add color using a water brush. I had used 3 shades of pink, 1 orange, 1 yellow, and 4 shades of green to color the image. 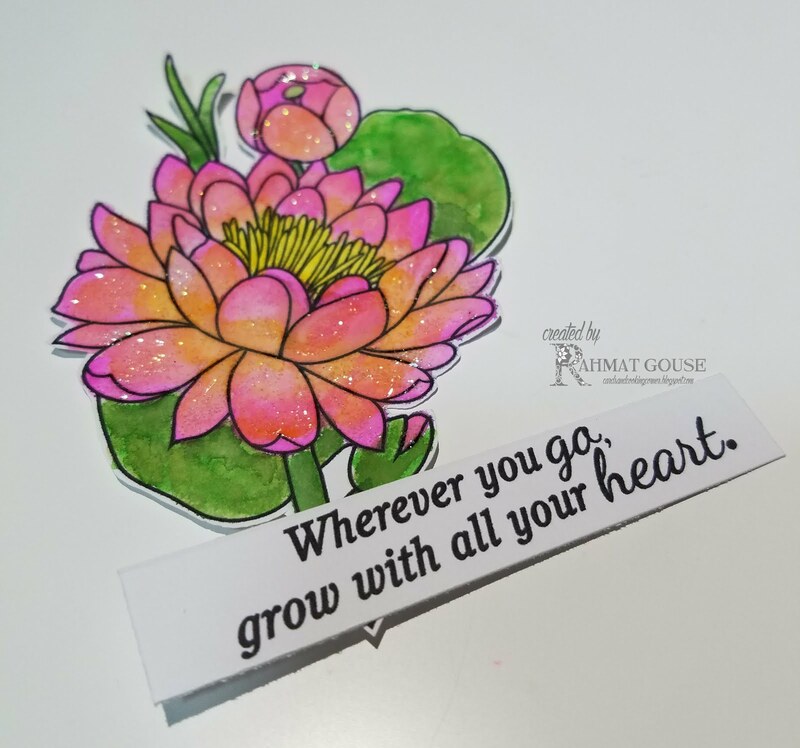 I fussy cut the image to add to the card, the sentiment is also part of the freebie. I also added some wink of stella to the flower. I used a striped stencil and inked it up using black soot distress ink and added some splatters using a shimmery silver water paint. I then arranged the flower and sentiment, the sentiment is edges with a shimmery maroon strip. A few jewels to finish off. Such a very pretty floral creation, many thanks for joining us at Allsorts challenge Flower Power theme this week. 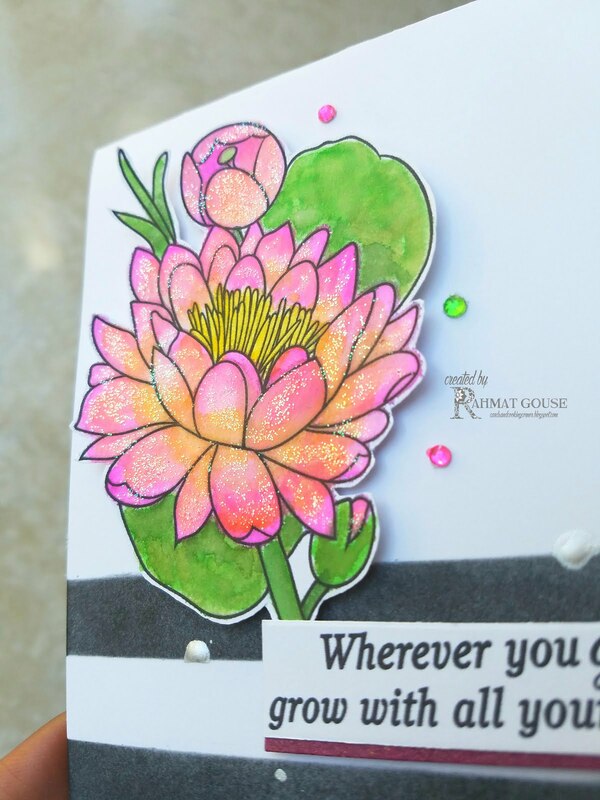 Love the shimmer you added to this magnificent water lily, Rahmat! Gorgeous card. So good to see you entering our "Anything Goes" challenge at Crafts Galore Encore this month. Thanks for supporting us and good luck in the draw. Pretty! Thanks for sharing at Moving along with the Times. Fabulous card, so glad you were able to prevent Math Wars! Very nice card, love the sparkles and beautiful sketch! Hello… Thanks for sharing your lovely card with Moving Along with the Times, it fits perfectly with our ‘English Country Garden’ Challenge theme. Hope you can join us again. What a totally enjoyable post! You made me smile with your school comments and brought back some math nightmares, too! Glad everything got sorted out. And wow! What a card! I really like the way you paired that vibrant colorful flower with the strong black and white lines. 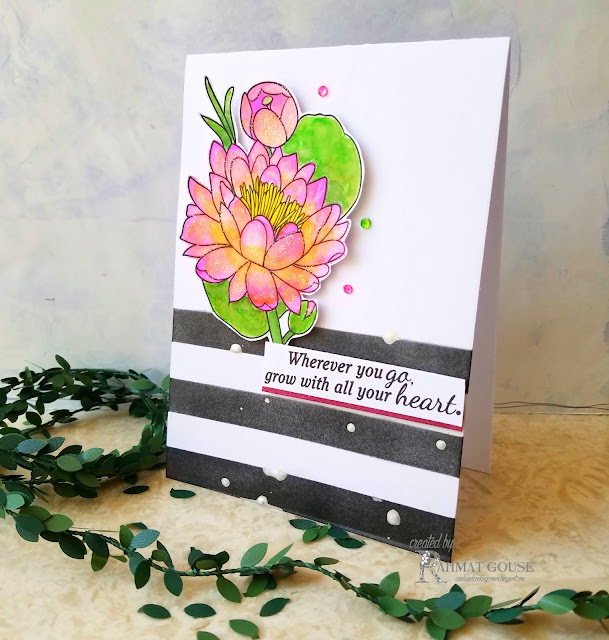 It is a stunner and I'm so glad you shared it with us for this week's Simon Says Stamp Monday Challenge!